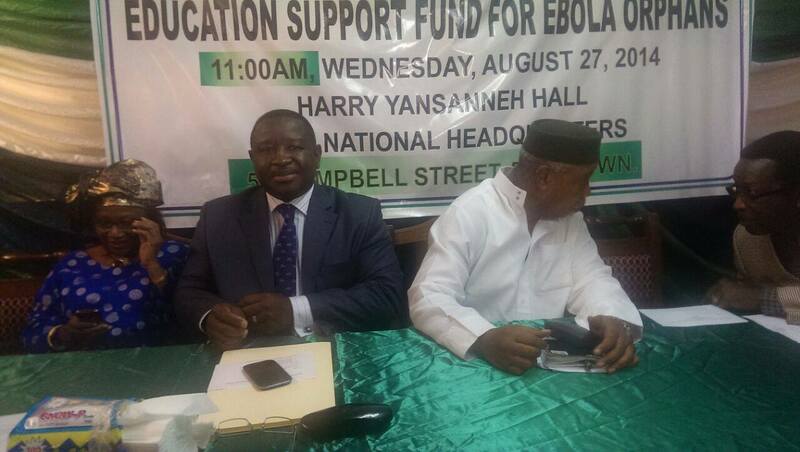 Today, 27th August, saw the launch of the Maada and Fatima Bio Foundation and Education Support Fund for Ebola Orphans in Sierra Leone, as the total number of confirmed and suspected Ebola deaths exceeds 450. With presidential and general elections more than three years away and the Koroma government in a quandary as to how best to manage this Ebola crisis, is Maada Bio paving the way for a second chance at the polls? When in 2013, we conceived the idea of establishing a Foundation, we were thinking of vulnerable children who may have either lost their parents, or are so poor that they cannot afford basic education, healthcare and food and other basic essentials of life. Already, we have thousands of such children in every community, chiefdom and district in this country, whose plight has been worsened by the continued economic hardship and growing poverty as well as inadequate schemes in place to care for them. It was against this backdrop that my wife and I thought of establishing a Foundation to help these needy children – thus, the Maada and Fatima Bio Foundation. One of the objectives of the Foundation is to provide scholarship to children from very poor families to give them access to education. 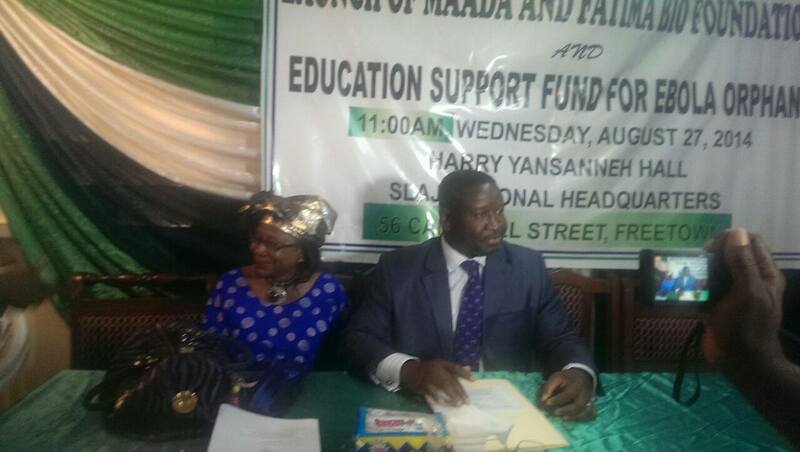 The Foundation was registered in Sierra Leone and was launched in London on May 30, 2014. We have been preparing for a grand launch in Freetown this year but unfortunately, we have an outbreak of this deadly disease, our common enemy, EBOLA. As a national leader, it is imperative that I join forces with government and other stakeholders to wage war against this virus. In a press release in June this year, I admonished Sierra Leoneans to believe that the Ebola disease is real, and made a solidarity call to everybody to join government and our development partners in fighting this disease. I travelled from London where I am currently based to my beloved Sierra Leone to join you all to fight this disease. At this juncture, let me use this opportunity to extend special appreciation to the medical professionals and members of burial teams in the fight against this deadly disease. In the course of saving lives, some lives have been lost leaving behind children and other loved ones. I would also like to thank the fourth estate and the civil society organisations for their invaluable role in sensitising the public and advocacy for more robust state response to combat this outbreak. To the international community, with our weak health system, this fight would have been impossible without your contribution. In particular, I would like to recognize the sterling role, bravery and commitment of Medicines Sans Frontier (MSF) in their efforts in treating Ebola affected persons. I wonder what would have been the situation without the MSF. To the World Health Organisation (WHO), Sierra Leone Red Cross and other multilateral and bilateral agencies, I also thank you for support to government and the people of Sierra Leone at this hour of need. On my arrival in Sierra Leone, I first met with President Ernest Koroma who took his time to brief me on the national response, including the challenges we face as a nation in our fight against this disease. I then consulted with various stakeholders from the districts to better understand the dynamics of this disease and its management. I was reliably informed that inadequate food at the quarantined homes of Ebola affected families constitutes a challenge in our fight. Immediately, I donated 320 bags of rice to such Ebola affected families in Kailahun, Kenema and other districts. We have already delivered 100 bags to Kailahun, 100 bags to Kenema and 20 bags to Bo. A total of 55 bags to 3 northern districts of Port Loko, Bombali and Tonkolili, 20 bags to Moyamba and Pujehun in the South and 25 bags to Western Area have been provided. These will be handed over to the respective district Ebola Task Forces for the target beneficiaries. My initial focus on rice was intended to draw the attention of government and the public that there are people in our communities who need food. I am pleased to learn that since my donation, many more people and institutions have now started providing food to Ebola affected families. I thank them for responding to this wake up call. Mr. Chairman, Ladies and gentlemen, it is no gainsaying that the Ebola outbreak will leave behind children that will need homes to live, clothes to wear, food to eat, medicines to take for illnesses and support for education. In line with the objectives, the Maada and Fatima Bio Foundation is establishing an Education Support Fund for Ebola Orphans. The purpose of this Fund is to provide education support for children of health workers who have died in active service, and all other children who have been orphaned by the Ebola disease. The Fund will provide educational needs of children between 6 and 18 years whose benefactors have died of the Ebola virus. The package will include uniform (including shoes), books and tuition for children. The foundation is providing initial seed capital of Le 25,000,000 into the Fund. This is only the beginning and is also intended to call on government and other stakeholders to care for these children. I call on all to contribute to this Fund and would like to call on government to immediately commence the design and implementation of a holistic national programme for this new poor and vulnerable Sierra Leoneans. The Fund will be managed by the Board of the Foundation and a Special Management Committee comprising teachers, community leaders and other stakeholders. The details on the management of the Fund including the composition of this Committee and eligibility criteria will be announced later. Meanwhile, Dr. Kadi Sesay, a renowned educationist will be the contact person. The Foundation is prepared to collaborate with government and other stakeholders who may be planning such schemes for effective coordination of the assistance. 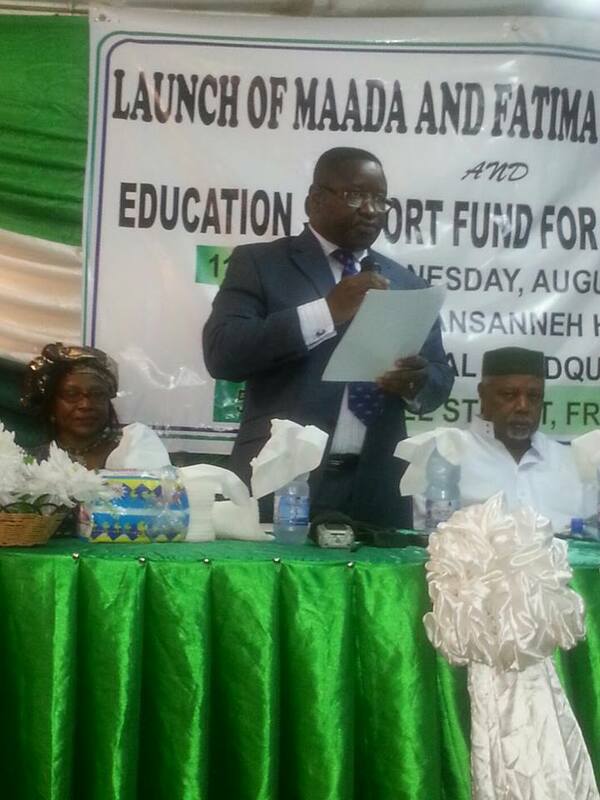 Mr. Chairman, Ladies and gentlemen, on behalf of my wife and myself, I now have the pleasure to launch the Maada and Fatima Bio Foundation in Sierra Leone. A grand launch ceremony will be organised when Sierra Leone is declared Ebola free and the state of public emergency is lifted. 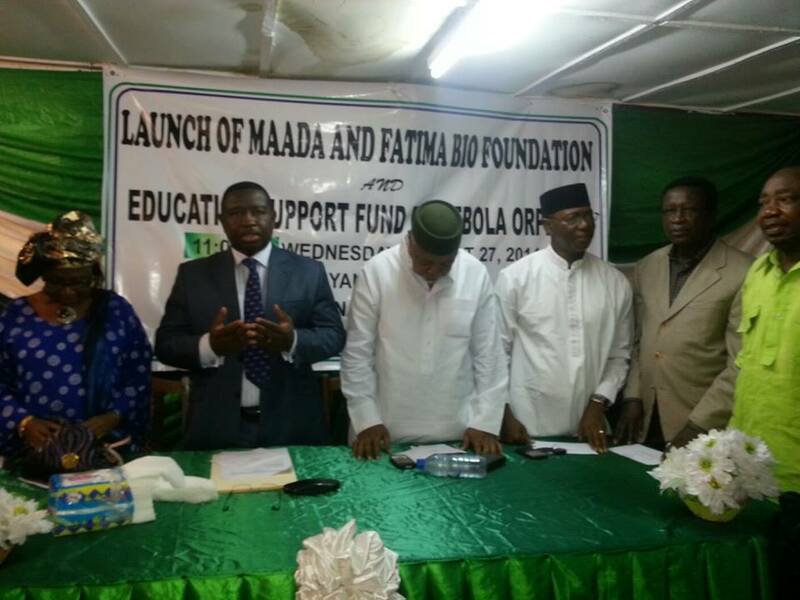 Also, on behalf of the Foundation, I am pleased to again formally launch the first support activity of the Maada Fatima Bio Foundation, the Education Support Fund for Ebola Orphans. Thanks so much for the wonderful initiative. As a development consultant, I am currently helping to use innovation to make Home of Mercy sustainable. Home of Mercy is a home for orphans in Bo. When the home started in 2008, our priority was to take in orphans or the rebel war, now we have shifted our focus to orphans who lost both parents to ebola. This is a great move, I will get in touch to explore areas of collaboration. Thank you, Maada and Fatima, for the great gesture for humanity. Maada Bio, again many thanks for all your efforts at this crucial time. You have handle others, by using your heart. Leadership is not about titles, positions or flowcharts. It is about one life influencing another. You are absolutely one of them the judges have to decide. This is the first good news I have heard since the Ebola outbreak in Sierra Leone. Maada Bio has set the ball rolling and I hope other Sierra Leoneans follow suit. There is a lot of work to be done post Ebola……..so we all have to roll up our sleeves and start working very hard.